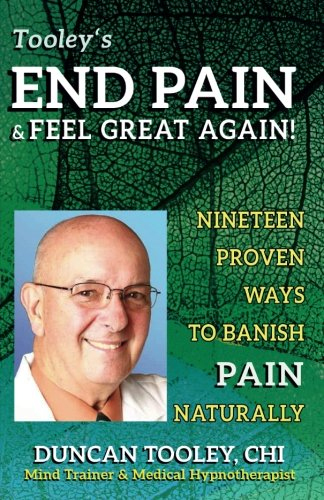 End Pain & Feel Great Again: Nineteen Proven Ways to Banish Pain Naturally! It’s published and ready for you in both paperback and Kindle versions. Your mind is running your body! You can switch off your pain by taking control of the pain center part of your mind. This book shows you 19 ways to feel great again, pain free without drugs or side-effects. It teaches you step-by-step how to use the power you already have to feel great and get your life back! This book catalogs the natural mind-over-body pain relief methods that have worked for my clients and that are backed by medical studies. The easy-to-learn and easy-to-use techniques comes from my discovery of the power of the mind documented in thousands of medical studies and demonstrated by hundreds of my clients who have turned off their pain and got their joyous life back. Any single one of these techniques may be all that you need. Or, you can learn several and use them in combination. Each chapter provides the basis for the technique and the few simple steps to use it. Buy the book now, use it, and feel great again!